Does U.S. natural gas pose a threat to Russia? Analysts believe that for the next several decades, the Americans will be unable to replace Gazprom as Europe’s key gas supplier. 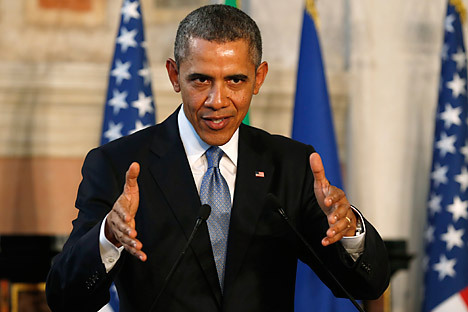 U.S. President Barack Obama is ready to allow exports of gas to Europe in order to free it from dependence on Russian gas. However, experts agree that this is a bold but not particularly realistic statement. At least for the next several decades, the Americans will be unable to replace Gazprom as Europe’s key gas supplier. "We are ready to authorize the export of as much natural gas each day as Europe uses each day," U.S. President Barack Obama said at a news conference on March 26 following the U.S.-EU summit in Brussels. Speaking of possible new sanctions against Russia over the events in Ukraine, Obama said that the EU and the U.S. should focus on energy. "Europe needs to look at how it can further diversify its energy sources," he stressed. This is a bold statement, according to Sergei Vakhrameyev, an industry expert with the investment company Ankorinvest. But there are a lot of buts here that indicate that Obama's threat cannot be put into action at least for the next several decades. In order to export gas overseas, in addition to liberalizing gas exports, the U.S. needs to build LNG terminals. Since 2011, the U.S. Department of Energy has approved only six applications for the construction of export LNG terminals, with the seventh approval coming at the end of March. Among those terminals approved are a Cheniere Energy Partners terminal in Louisiana and a Freeport terminal in Texas. Meanwhile, 25 more projects have still not received the go-ahead. However, even the approved terminals have to be built first. The first LNG export terminal will be completed no sooner than the end of 2015, which means that the first export deliveries of U.S. gas cannot start earlier than 2016. The construction projects that have already received approval will be completed by 2020, with projects beyond that date not having been approved yet. The total capacity of the approved terminals that will be commissioned between 2016 and 2020 is 118 billion cubic meters of gas. However, even if the U.S. were to supply the total amount of 118 billion cubic meters of gas directly to Europe, European countries would still be unable to give up Russian gas. In 2013, Russia supplied some 135 billion cubic meters of gas to Europe (excluding Turkey), according to Sergei Vakhrameyev. "It is impossible to give up such an amount overnight," he pointed out. Not to mention that the prospects of U.S. gas entering the European market are still quite remote. Besides, the anticipated amount will not be allowed to be exported in its entirety since it may not leave the U.S. with enough gas for domestic consumption. "Before 2012, the U.S. was experiencing a shortage of gas, although this shortage was constantly diminishing. By 2013, it had a surplus, though not a large one, so it is not yet clear how much gas it will be possible to supply to the European market," said Rustam Tankayev, managing director of the company Info-TEK-Terminal and a leading expert with the Russian Union of Oil and Gas Producers, in comments to news portal Vesti.ru. Another problem is that initially the U.S. planned to supply its gas not to Europe but to the more profitable Asian markets. "Traders can supply this gas anywhere. However, the market is such that in Asia gas prices are considerably higher. Besides, traders are the most pragmatic market players. It is not clear how they could be made to sell gas at cheaper prices (say, to Europe)," said Sergei Vakhrameyev. According to him, in Asia the price of gas is $15 per million British thermal units (BTU), in Europe, slightly under $12. The difference of $3 translates into about $100 per thousand cubic meters. That is to say that 1,000 cubic meters of gas in Asia costs at least $100 more than in Europe, and in some cases even more than that. "It may happen that first U.S. gas will go to Asia and when prices there go down (because of excessive supply), they may start deliveries to Europe," suggested Vakhrameyev. In other words, the (partial) replacement of Russian gas in Europe with American gas is, one way or another, pushed back by many years. Even if the U.S. manages, by some miracle, to resolve all of its domestic difficulties with LNG supplies to Europe, it will have to deal with another one, that of the lack of a ready-made infrastructure there. This problem is particularly acute in Eastern Europe, which is most dependent on Russian gas. For instance, Lithuania relies on Russia for 100 percent of its gas supplies. "The U.S. can supply gas to West European countries, for example Spain, the UK, and France, because there are LNG terminals there, whereas supplies to Eastern Europe are impossible because of infrastructure limitations. There are no LNG terminals for receiving American gas there and no capability to redirect American gas via a gas pipeline from Western to Eastern Europe. All gas flows go from east to west," Vakhrameyev explained. Furthermore, European countries have 20-year-long contracts with Gazprom. "What are they going to do with those? Break them?" Vakhrameyev wondered. Of course, Europe's dependency on Russian gas will be gradually reduced over time, but very slowly, he concluded.